What people say in their final moments matters. And it especially mattered when Jesus uttered his last words on the cross. Because his final words teach us so much about who he is, what he did, and God’s incredible love for us! 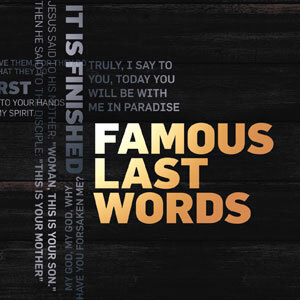 Famous Last Words, takes you straight to the prolific words Jesus spoke in the final moments before he died. You’ll be encouraged and inspired as you discover that even in Jesus’ darkest hours, he spoke words of comfort and truth… famous last words that can be an incredible source of peace and hope for you today. The truth is that we all thirst for something. The truth is, Jesus was forsaken on the cross so that you wouldn’t be. The truth is, your Father in heaven will never forsake you. The truth is that your hope is found at the foot of the cross. The truth is, there is comfort waiting for you at the foot of the cross. Do you try to bargain with God? Or do you rest in Christ’s forgiveness? Today, Dr. Young wraps up his message, Words of Forgiveness, and reminds you of the grace available in Jesus. The truth is, even the most familiar Bible stories have the power to surprise you.